I started this post a few moments ago at 11:10 PM, the night before it’s scheduled to go up. Working past midnight is not unusual for me. As I type this, the room is dark, and my husband is long asleep in the bed by my desk. Poor guy, he’s learned to sleep to the accompaniment of the taps of my keyboard and ignore the bright light of my monitor (and it’s a big one, too). I’ve spent today writing. . .some. And I took some unusual time to spend with my two younger kids, one of whom is on spring break from college. Other than that, I worked on writer-related stuff. I responded to emails and messages. I commented on posts from readers. I corresponded with the wonderful people who keep my business life moving along, setting up tasks and goals for the next few weeks. I chatted with some fellow authors about some business issues and how to best address them. I worked with some other fellow authors on setting up an event we’re doing this Sunday to promote our books. I boxed up prizes and signed books to send to readers. I worked with my business partner on some details for the book event we’re hosting in July this year, here in Orlando. So, yeah. Really a pretty light day. I don’t think I know a single author who doesn’t work hard. Most of us have hours that would make the most hard-core stock broker or dedicated doctor cringe. We’re up late, we’re up early, and we never stop. We do it, as the lovely meme above reminds us, because we love it. 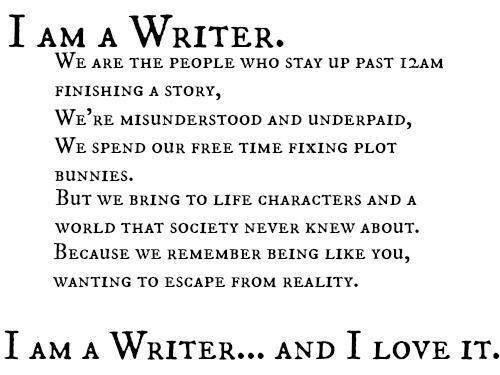 We love the characters we create, we love the readers who love those characters along with us, we love our fellow writers (well, mostly) and we love the idea that on a daily basis we are peopling the world with more fabulous fictional folk. But even when you do something for love, it’s nice to see a paycheck. Last year, Amazon introduced a program called Kindle Unlimited. It’s basically Netflix for books: by the company’s own description: Enjoy unlimited access to over 700,000 titles and thousands of audiobooks on any device for just $9.99 a month. Sounds awesome, huh? Great idea. 700,000 books for about the price of a cup and a half of coffee at Starbucks. What a bargain. And of course it is. For some readers, this works out well. Even some authors have benefitted from the program. I’m not going to get into the whys and wherefores here. Others have done it far better than I could, and I’ll share some of the links below. I strongly encourage you to read these posts and articles before you make up your mind about KU. But as time went on, authors began to realize that we can’t keep underpricing our books and continue producing them. It may seem that creating an ebook should be cheap and easy, but let me assure you, it is neither. Delivery is less expensive; other than that, it’s the same basic premise as any hardback or paperback you might buy at Barnes and Noble for $16.99. It must be edited, proofread and formatted. A cover must be created and produced. Often, artwork for that cover must be created. Nothing is cheap and nothing is free. And yet. . .it seems some readers expect that our books should be. Today, in March 2015, all of my ebooks are priced at $3.99 and under, with the exception of The King Series Boxset which is FOUR full-length books plus a short for $6.99. Two of my books are free (Fearless and Best Served Cold). Do I feel my books are fairly priced for a reader? Absolutely. Do I think they’re fairly priced for me? Not really. I’m not complaining. I love my job, and I would do it for free. That’s the truth. I’d write even if you charged me to do it. But I don’t want to write for free, and like any other professional, I hope I’ve earned the right not to do so. Happily, I am surrounded by fabulous readers who never, ever question the value of my books. They make me happy on a daily basis, and I’d pay for that luxury, too. It’s business practices like KU and others going on in other book sellers that make us feel undervalued, under-respected and just plain tired. So before you sign on for Kindle Unlimited, or for any program that affects how authors earn, do some research. Think about how much you value the work of your favorite authors. We’re worth at least the same as a cup of designer coffee, right? Speak Up. Reach Out. Offer Hope.